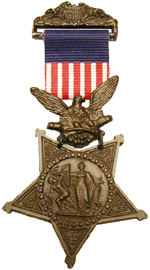 Citation: The President of the United States of America, in the name of Congress, takes pleasure in presenting the Medal of Honor to Regimental Chaplain Milton Lorenzo Haney, United States Army, for extraordinary heroism on 22 July 1864, while serving with 55th Illinois Infantry, in action at Atlanta, Georgia. Chaplain Haney voluntarily carried a musket in the ranks of his regiment and rendered heroic service in retaking the Federal works which had been captured by the enemy. The President of the United States of America, in the name of Congress, takes pleasure in presenting the Medal of Honor to Chaplain John Milton Whitehead, United States Army, for extraordinary heroism on 31 December 1862, while serving with 15th Indiana Infantry, in action at Stone River, Tennessee. Chaplain Whitehead went to the front during a desperate contest and unaided carried to the rear several wounded and helpless soldiers. The President of the United States of America, in the name of Congress, takes pleasure in presenting the Medal of Honor to First Lieutenant (Chaplain) James Hill, United States Army, for extraordinary heroism on 16 May 1863, while serving with Company I, 21st Iowa Infantry, in action at Champion Hill (Baker’s Creek), Mississippi. By skillful and brave management First Lieutenant Hill captured three of the enemy’s pickets. Tucked on a side street in Gettysburg Pennsylvania is a small monument to Horatio Stockton Howell, Chaplain with the 90th Pennsylvania Regiment that was killed on the steps of College Lutheran Church. The Church had been established as a Union hospital shortly after the battle of Gettysburg began. Chaplain Howell was born near Trenton New Jersey on August 14, 1820. He was the fifth of seven children born to William and Abigail Howell and was ordained in the Presbyterian Church in 1853 and served the Church in Delaware Water Gap Pennsylvania. While serving the Church in Elkton Maryland, Chaplain Howell says firsthand what he called the “evils of slavery.” He was convinced by the influence of his Mentor, the Rev. James Wilson that the institution of slavery “would reduce to the condition of brutes those whom God had created in his image and for whom Christ had died.” It was his mentor that urged him in 1862 to enlist in the Army as chaplain. On July 1, 1863, the first day of the Battle of Gettysburg, the Confederates engaged the Union troops near the Lutheran Theological Seminary. The 1st Corps had established a field hospital in the Church located not far from the seminary itself. By midafternoon on that day, it was reported that more than 140 men were laying in the sanctuary and on the benches being tended to by hospital personnel and Chaplain Howell. Today, at the bottom of the Church steps, stand a monument to Chaplain Howell. 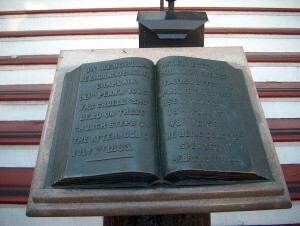 The monument is an open Bible on a stand. One side of the Bible tells Chaplain Howells story, and the other side has several quotes of Scripture. It is rather sad that this monument will go almost unnoticed by visitors to Gettysburg, but it is fitting that it is at the actual site of his death. *New York Monuments Commission for the Battlefields of Gettysburg and Chattanooga, Final Report on the Battlefield of Gettysburg, (Albany: J.B. Lyon Company, 1900), I:24. 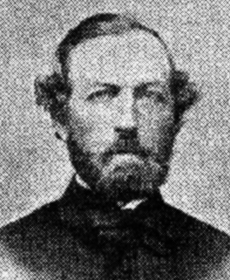 The Reverend Joseph Henry Thayer was born November 7, 1828 in Braintree Massachusetts to Joseph Thayer and Evelina Stetson Thayer. He studied at the Boston Latin School and graduated from Harvard in 1850. He went on to study theology at Harvard Divinity School and Andover Theological Seminary and was ordained a minister in the Congregational Church in 1859. That same year Rev Thayer married Martha Caldwell Davis in Boston and they had five children. He served Churches in Quincy and Salem Massachusetts and on September 17, 1862 was commissioned chaplain with the 40th Massachusetts Infantry Regiment and reported for duty on the 23rd of September that same year. The 40th Massachusetts was sent south to Fort Ethan Allen near what is now Arlington Virginia. They were involved in several skirmishes in that area during 1862 and 1863. 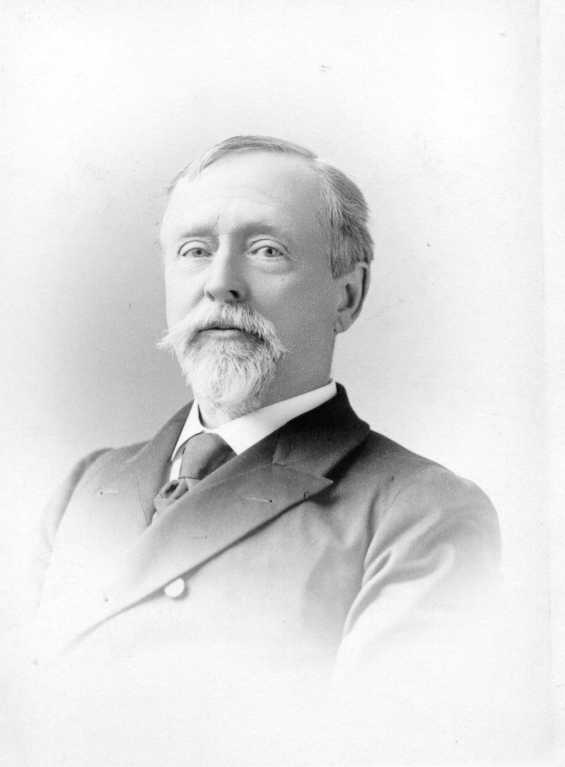 Chaplain Thayer resigned his commission on May 15, 1863 and returned to Massachusetts. It was not uncommon for Chaplains to serve for a short period of time the average length of service was 18 months. There are two main reasons for this one had to do with the average age of the chaplain which was 58 and the other reasons was time away from their church. Some Churches would only grant a short leave for their minister to go off to war and then they had to resign and return. It is unclear why Thayer resigned but it might have been to take the position at Andover. From 1864-1882 he was professor of sacred literature at Andover Seminary and was also a member of the American Bible Revision Committee and was recording secretary of the New Testament Company working on the Revised Version of Scripture. His chief work was a Greek-English Lexicon of the New Testament that he devoted 25 years of his life to complete. However, shortly after his Lexicon was published Gustav Adolf Deissmann published a work based on Egyptian papyri that would revolutionize New Testament Koine Greek and thus made Thayer’s work obsolete. In 1884 he became the Bussey Professor of New Testament criticism at Harvard Divinity School where he served until shortly before his death on November 26, 1901. 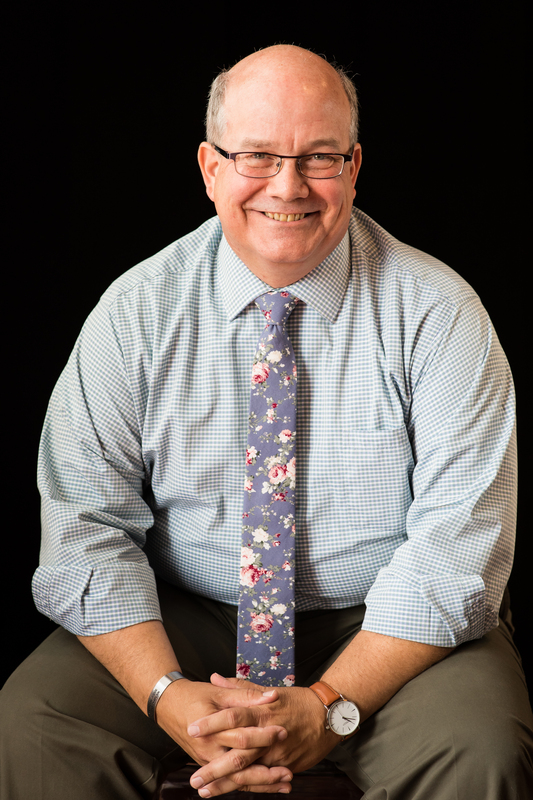 The Reverend Thayer has come under some criticism of his works and has been called, in some Evangelical circles, a Unitarian and claim that he departed from traditional orthodox Christian beliefs. There seems to be much disagreement on this. When I began my study of the chaplaincy during the time of the American Civil War, the first person I came across was the Reverend Arthur Buckminster Fuller. He graduated from Harvard College in 1842 and then Harvard Divinity in 1847, but it was the fact that Chaplain Fuller was one of the 66 Union Chaplains killed during the war. Arthur Buckminster Fuller born August 10, 1822 to the family of Congressman Timothy J. Fuller and Margaret Crane and settled on the family farm in Middlesex County Massachusetts. Fuller received a classical education at Leicester Academy and Harvard College graduating in 1843. He then moved on to Belvidere Illinois where he ran an academy and that same year became a lay preacher in the Unitarian Church. The school closed 18 months later and Fuller returned east and entered the Divinity School at Harvard. He served several churches over the next years and was well known as an outspoken evangelist for his plain speaking that was attractive to the “regular” folk and farmers in the area. He practiced what he preached and was active in the temperance movement and was also an outspoken abolitionist. He served on the Boston School Board and was an advocate for free public education for all. In the mid-1850’s he published two sermons advocating the replacement of all “foreign” influences in the Boston School System. Believing that only Protestant theology should be taught in the school system, this was a direct attack on the Roman Catholic Church. Fuller was a progressive thinker for his day, and he believed that it was proper for a woman to pursue a professional career outside of the home. With the start of the Civil War Fuller resigned his pulpit at the Unitarian Church in Watertown Massachusetts. He signed on as regimental chaplain with the 16th Massachusetts Infantry Regiment and prepared to serve in the field with his unit. When asked whether he had a sense of the danger he could face he responded, “I am willing to peril life for the welfare of our brave soldiers, and in our country’s great cause. If God requires that sacrifice of me, it shall be offered on the altar of freedom, and in the defense of all that is good in American institutions.” As a Unitarian, he believed he was required every day to make it a holy day and that salvation demanded not only to serve God but service to his fellow man. Chaplain Fuller was not like other Regimental Chaplains and was found at the side of his soldiers on the battlefield. He did not carry a weapon of any kind but there he was, right next to his troops, praying and offering what assistance and encouragement he could during the battle. “I know no holier place, none more solemn, more awful, more glorious than this battlefield shall be” he would write in his journal. When the 16th was relieved of duty on the battlefield, Chaplain Fuller was sick, and he needed time to rest. Chaplains, for the most part, were much older than the average soldier he was forty-one years old at the date of the battle, and were not accustomed to the harsh life of the soldier. Along with that, chaplains were tireless in their service and support of their soldiers often sacrificing their health for that of their troops and that is what happened to Chaplain Fuller. He was finally convinced to take leave and he returned to Massachusetts for some rest and recuperation, but that was to be short lived. 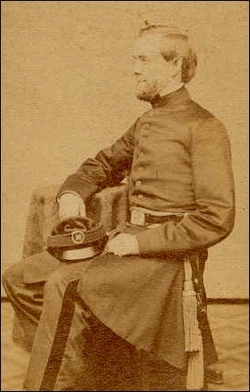 Chaplain Fuller returned to his regiment in October of 1862 and was greeted warmly by the soldiers of the regiment. From that point on the regimental surgeon would not let him go into battle with his troops, his health being so fragile the doctor did not want him to be a liability on the battlefield. Chaplain Fuller would remain behind and offer what service he could with the troops in the rear. His illness was such that in December of 1862 he was declared un fit for duty, and he would have to resign as chaplain. In a letter to his wife he wrote, “You can hardly realize the pain I felt when I found I could not share the field campaign without throwing away health and life.” He was willing to sacrifice all he had but the Army would not let him. He preached his final sermon to the regiment on Sunday, December 7, 1862 and was discharged from the Army, and he prepared to return to Massachusetts. Writing again to his wife, “If any regret were mine, it would be that I am not able to remain with my regiment longer, but this is, doubtless, in God’s providence.” His only consolation was that a place had been found for him as a hospital chaplain so he would be able to continue to serve. As the assault on the City of Fredericksburg started, Rev. Fuller lingered with his regiment. Perhaps he was not quite ready to leave their side or maybe it was God telling his to stay we shall never know. The engineers building a bridge across the Rappahannock came under fire from Confederate snipers, and it was decided that an assault would be made across the river. The call went out for any available man to help row the boats across the river, and Fuller was right there to volunteer. Reaching the other side of the river he found himself with the men of the 19th Massachusetts. He stayed with them as their chaplain had long since abandoned them, and he was of the firm belief that the men needed a minister by their side during the battle. He secured permission from the regimental commander to stay and stay he did; he was shot and killed instantly. He died doing what he was called to do, and he died serving his men to his last breath. His funeral was held in Boston where he was given grand eulogies by several ministers that knew him and his work. The funeral procession brought the flag draped casket to the Mount Auburn Cemetery in Boston for its final resting place. 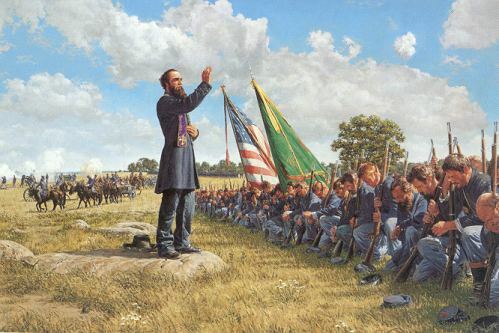 One Hundred and Fifty years ago, two great armies were marching toward the small Pennsylvania town of Gettysburg. The inhabitants of this small town numbered only 8,000 souls and they were going to be in the middle of the one of the greatest battles of the United State Civil War. From July 1st until July 3rd the Army of Northern Virginia with almost 72,000 men, commanded by General Robert E Lee and the Army of the Potomac with almost 92,000 men, Commanded by Generals George G Meade and John F Reynolds, battled it out on this field that left more than 7,800 dead, 27,000 wounded, and more than 11,000 captured or missing. The ground literally was read with the blood of both blue and gray. Although this battle has gone down in history as one of, if not, the bloodiest battles in American history, there is one little known event that took place on July 2nd in the middle of the battle. Fr. 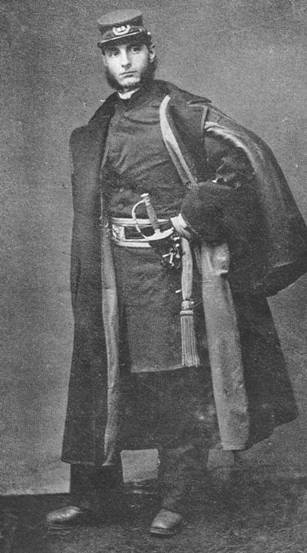 William Corby, Chaplain of the 88th New York Infantry Regiment of the Irish Brigade, had been with his men since the start of the war. He was living at Notre Dame University when the war began and became chaplain of the Regiment serving until the end of war. What was remarkable about this is that the average service of a Chaplain was 18 months as most of them were in their 50’s and could not adjust to the life in the field. The role of the Chaplain in the Army at the time of the Civil War was unclear. They were appointed by the regimental commander after being elected by the field grade officers. They were paid at the rank of Captain of Calvary $100 per month and $18 for rations, a tent, and forage for one horse, which they had to provide for themselves. Chaplains in the Confederacy did not fare as well. Most of them did not get paid at all. May our Lord Jesus Christ absolve you; and by His authority I absolve you from every bond of excommunication or interdict, so far as I am able and you have need. Moreover, I absolve you from your sins in the name of the Father, and of the Son, and of the Holy Ghost. Amen. All of this took place within ear shot of the Peach Orchard and Little Round Top with canon and musket fire all around them. Father Corby did what he could to prepare the men under his care for battle that day and for what would face them in the next world. There exists now a statue of Father Corby perched upon the very rock where he gave this absolution in the Gettysburg National Battlefield. I do not think there was a man in the brigade who did not offer up a heart-felt prayer. For some, it was their last; they knelt there in their grave clothes. In less than half an hour many of them were numbered with the dead of July 2nd. As I write these words, thousands of people are heading toward Gettysburg, many of them traveling on the same roads that those soldiers did 150 years ago. They go to reenact one of the bloodiest days in American history. They do this to honor those who fought on both sides for what they thought was right. Those who wore blue and those who wore gray were fighting for their version of America, for their rights and the rights of others. Some believe the war was inevitable and sooner or later it would happen. I cannot help but this of the priest from Notre Dame who stood on that rock and gave what comfort he could. Father Corby has been quoted as saying that he meant this absolution not only for those assembled before him but for all of those fighting on that day that they fight the good honorable fight. Father Corby died in 1897 after serving as President of Notre Dame University. The men he served with loved him very deeply and always invited him to speak at reunions and other gathers that he was able to attend. We must never forget our history and we must never forget those who gave so much for America.